Flat web development icons on rounded square color backgrounds. Web Development Line Icons. Vector Illustration of SEO Symbols over Polygonal Background. Line Web Development Icons. Vector Collection of Modern Thin Outline Coding and Programming Symbols. Flat web development icon set on round color background. Vector set of 240 64X64 pixel perfect flat line web icons. Fully editable and easy to use. Set of flat design concept icons for web and mobile services and apps. Icons for web design, application development, seo and web development. Set of thin line web icons of web design and development. Premium quality icons for website, mobile website and app design. Trendy flat line icon pack for designers and developers. 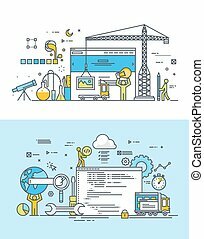 Icons for website and app development, programming, seo, website maintenance, online security, responsive design, cloud computing. Design and development thin line flat design web icons collection. Icons for web and app design, easy to use and highly customizable. Set of thin line flat design concepts of website design and development. Vector illustrations for web banners and promotional materials. Set of flat design concepts for web development. 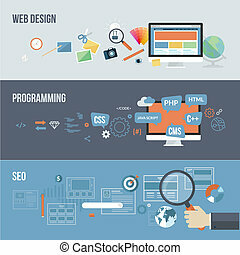 Concepts for web design, programming and SEO.